The “Blog” of “Unnecessary” Quotation Marks: oh, the "buckets"
This place has pretend BUCKETS. Awesome. Thanks, Stephanie and James. They're also not so sincere - notice the faint quotes around the word please. It's almost as if someone wrote them and then erased them again. I wish we could see the "buckets". It doesn't seem an appetizing way to market fruit. 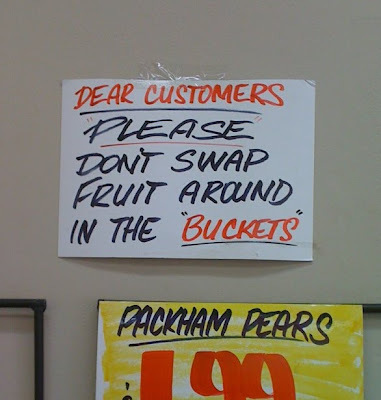 Bushels, baskets, or boxes, sure. 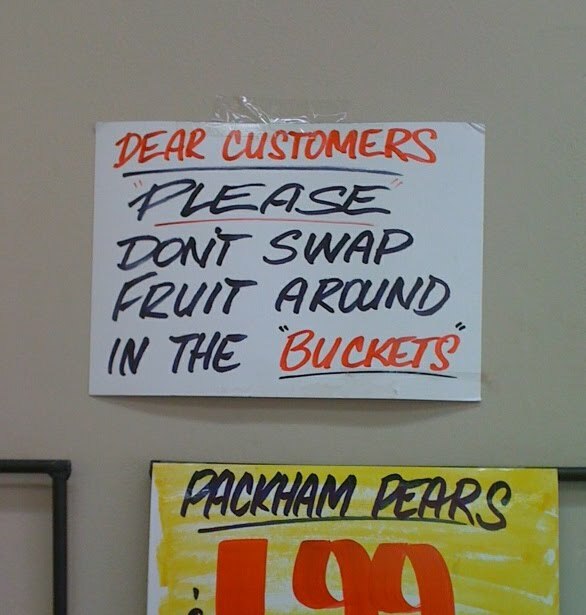 But I can't imagine buying fruit out of something deemed a "bucket." I "love" when they underline 'please' while putting it in quote marks. I agree with Paul, i want to go in with the black marker and change the 'P' in SWAP to a B.